Why you should know her: Award-winning California poet Tess Taylor is Randolph College's current Anne Spencer Poet-in-Residence and will be sharing her work during a reading on April 4. There's a certain lyricism in the way Tess Taylor speaks, a flow in the language that feels like you're being enveloped among the pages of her poems. She repeats certain phrases for emphasis as if they were stanzas and quotes Emily Dickinson's "To make a prairie" on a dime to explain the literary term "metonym." She plucks up a passage from the works of Seamus Heaney when asked about the modern poet's role in society and luxuriates in the swirl of imagery as she likens poetry to fishing. "You are waiting for things to emerge in your mind and take shape," Taylor says as she stares out the window of her temporary office on the third floor of Randolph College's Smith Hall. "...You cultivate a sense of watchfulness and then you follow it out. Kind of like reeling in a fish, you've just got to hang on and keep going with it." 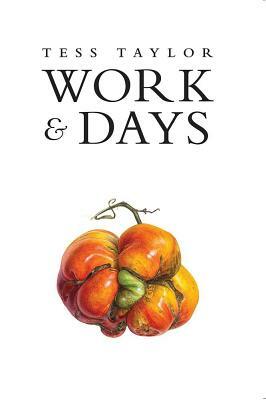 So far in her career, Taylor has followed her poems to Monticello in "The Forage House," which explored her complex feelings at being a descendant of Thomas Jefferson, and to three acres of Massachusetts farmland in 2016's "Work & Days" — a collection that was named one of the best poetry books of 2016 by The New York Times and called "our moment's Georgic" by literary critic and Harvard University professor Stephanie Burt. "In Tess' work, you sense the long history of poetry — the way her poems are informed and infused by it without ever seeming subservient to or derivative of," says Laura-Gray Street, chair of Randolph's English department. She first met Taylor in 2015 when the poet read at Poplar Forest. Taylor is presently chasing the currents for her next volume of poetry, "Rift Zone," which examines the history of El Cerrito, her California hometown, and both the physical and metaphorical fault line on which it is built. "It's going to be, like, a core sample. It's drilling down, but into California," the Bay Area poet says. "... If you think of the scale of 300 years, it's belonged to four nations: Ohlone, Spanish, Mexico, America." Taylor also has been experiencing the history and culture of Lynchburg while she visits the city as Randolph College's newest Anne Spencer Poet-in-Residence, a title that comes with a four-week teaching stint and an upcoming reading on April 4. "Tess' poems are crisp, compact, utterly vivid and rich with earth and insight. Her scope is both intimate and global," Street says. "She tackles important questions of [identity], race, and environment, of personal and collective responsibility, at a time when those questions are of increasing urgency."